Each of the past three Olympics (summer or winter), a Canadian has won a medal in an event appearing for the very first time. 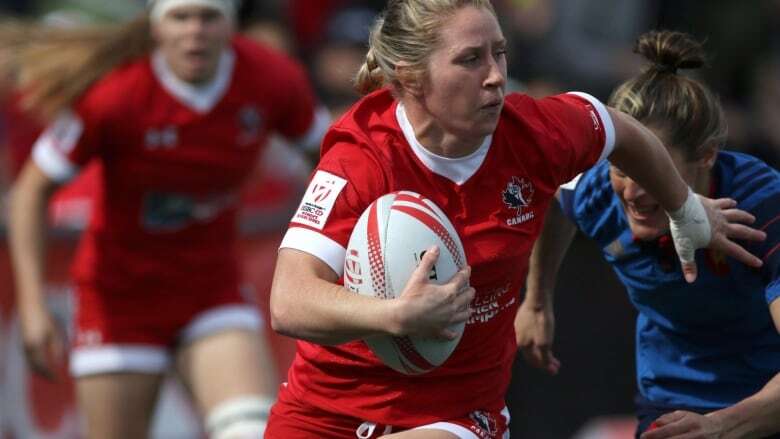 When women's rugby debuts at this summer's Rio Olympics, the 12 women who make the Canadian team will have a good chance to extend an interesting streak. At each of the past three Olympics (summer or winter), a Canadian has won a medal in an event appearing for the very first time. And if the debut medal streak continues, Rugby Canada's Kayla Moleschi wants gold: "Every time I go to sleep at night I think of that gold medal and we're not going to the Olympics to win a silver, and no team does," said the 25-year-old from Williams Lake, B.C. The Canadian team is a medal contender. They are a force on the Women's Sevens Series, the sport's international tour. They're playing their final tune-up tournament this weekend in France. The team finished second-overall last season, earning them an Olympic berth. They have finished in the top 3 of 12 of 19 tournaments since 2012-13. If the women's rugby team can do it, they'll continue a streak that goes back to Vancouver 2010 when skier Ashleigh McIvor became Olympic champion in the first-ever appearance for ski cross. At London 2012, it was bronze for both kayaker Mark de Jonge in the shortened K-1 sprint and the women's track cycling team pursuit squad. In Sochi, at the 2014 Winter Games, Team Canada's had five medals in debut events; only the U.S. had more. Canadian women have a winning tradition in first-time Olympic events that spans decades. Two examples from a long list include Ethel Catherwood winning the high jump in 1928 and Clara Hughes finishing with cycling bronze when the individual time trial first appeared in 1996. Canadian women have also won medals at four-straight Olympics since trampoline was added in 2000. Among those medals were Karen Cockburn's bronze (2000) and two silvers (2004, 2008); trampolinist Rosie MacLennan was responsible for Canada's only gold of the 2012 Olympics. Relative to other countries, girls have more opportunity to play sport in Canada, and this leads to stronger experience and advanced preparation. Moleschi and most of her teammates started rugby in Grade 9. The national rugby program has been centralized in B.C. since 2011. "These last four years of preparation have been some of the hardest days of our lives and it's not going to get easier and we knew that from day one," said Moleschi. "The amount of dedication we've put in the last four years is showing. We're a fit team and we are ready to dominate." Rugby sevens, not surprisingly, is seven-a-side on the full-size field. A gold medal final is two punishing 10-minute halves of non-stop sprinting and tackling. The Canadians picked up valuable experience by winning Pan Am gold in 2015. The sizeable crowd in Toronto provided at least a taste of what it will be like at Rio's 15,000-seat Deodoro Stadium. What about men's rugby and golf? The men's rugby sevens team also won Pan Am gold at home and still have a chance to qualify for Rio if they win the final Olympic qualifying tournament, June 18-19 in Monaco. If the Canadians make it, they too could be considered debutantes. The 15s version (union) of men's rugby was last featured at Paris 1924, and is vastly different from rugby sevens. Men's and women's golf are returning to Olympic competition, so they aren't debut events. Although, it's been a long time for the links; the men haven't played since 1904 — Canadian George Lyon won gold — and the lone women's tournament was in 1900. World No. 6 Brooke Henderson and No. 119 Alena Sharp are Canada's probable entries. They also have rugby-like optimism: "I think if Brooke and I can both get on that podium that would be something amazing, obviously that's our goal," said Sharp. On the men's side, it would be Graham DeLaet of Weyburn, Sask., and David Hearn of Brampton, Ont., if the team was chosen today based on the Olympic selection rules.